Thanks to the Canadian Lutheran for this story about CLTS grad (2000) Harold Ristau. OTTAWA – On May 31, 2014 Rev. 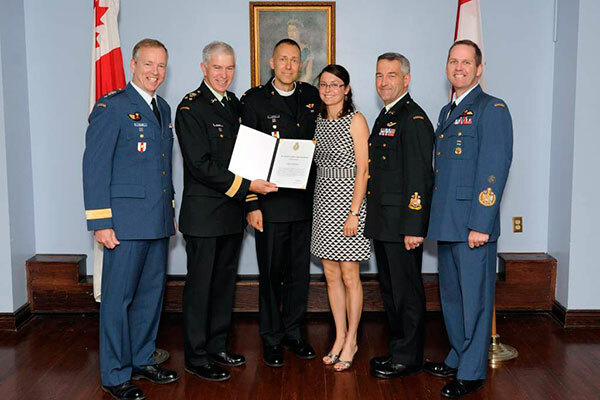 Dr. Chaplain Harold Ristau—a member of Lutheran Church–Canada—received the Chief of Defense Staff (CDS) commendation, which is one of the highest recognitions in the Canadian Armed Forces (CAF). Dr. Ristaua was honoured along with 11 other military personnel recognized for various incidents of outstanding service. The citation was triggered by the important impact of Dr. Ristau’s book At Peace with War (Wipf & Stock) on the training system. As part of a Canadian Armed Forces Appreciation weekend, the commendation recipients and their spouses participated in the nation’s annual “red shirt run,” a visit to the military museum, and a tour of parliament pinnacling in a standing ovation from the Prime Minister and all in attendance during Question Period in the House of Commons. Healthy patriotism and a zeal for ministry opportunities has inspired many pastors to join the CAF, resulting in a welcome increase of LCC chaplains in both the Regular and Reserve Forces over the years. LCC’s chaplains have an excellent reputation of providing faithful service to Canada’s troops. 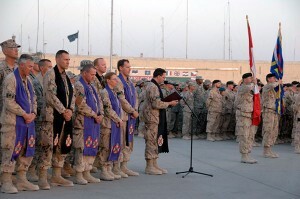 The Church prays that this eagerness to support our troops through military chaplaincy continues as there remains an overwhelming demand for chaplains, especially in the Reserve Forces (specifically in the ABC district), which normally require a minimum of one evening per week and one Saturday per month of their time.